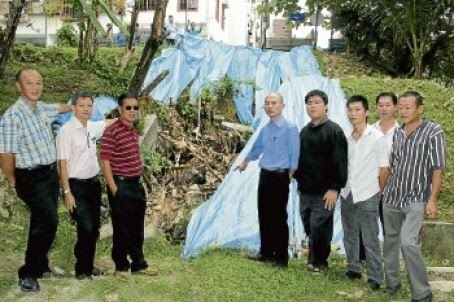 Residents of the Nova 1 condominium in Taman Sri Sinar, Kuala Lumpur breathed slightly easier on Jan 11, as contractors appointed by the Kuala Lumpur City Hall (DBKL) arrived that morning to shore up an eroding slope next to their residence. According to Patrick Chan Yew Choong, a member of Nova 1's management corporation (MC), the soil erosion was taking place on the piece of land next to Nova 1. Residents feared if the erosion continued, it could have negative consequences for the land which Nova 1 was built on. Pointing to the retaining wall which separated Nova 1 from the road, he said further erosion could cause the wall to crack, and give way if corrective action was not taken. "If the retaining wall goes, then the land which Nova 1 is built will erode too," said Chan. However, MC chairman Manoharan Dhanaraj said DBKL did not take any corrective action despite repeated enquiries from the residents. "The slope started eroding, then we noticed that the concrete drain had cracked and collapsed back in March 2011. We reported the matter to DBKL in May last year, whereby we were given a report number as well as the contact details of the people handling this case." 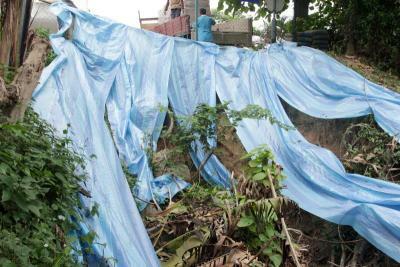 "What DBKL did in the last week of December, was to put up canvas sheets to prevent more rain from eroding the soil. We had to seek the assistance of Segambut MP Lim Lip Eng," he added. Lim said after discussions with the residents on Jan 4, he took up the matter with DBKL the next day. "On Jan 6, they informed me that they will start work on Jan 9. They sent people down to assess the situation and they started moving in material to repair the collapsed drain walls," said Lim. Lim hoped the repairs would be completed quickly, to minimise further erosion from the rain. According to Manoharan, the time estimated for repairs by the contractor was put at three weeks. There were other problems afflicting the slope, such as leaking pipe connectors belonging to a water pipe owned by Syarikat Bekalan Air Selangor (Syabas), which Manoharan and Chan theorised might have also led to the erosion problems on the slope. "We called Syabas about the leaking pipe connectors and they only replaced it recently. But they only replaced one, and not the other," Chan said.